Native ads are ads formatted to fit the surrounding content and visual design, making them more likely to be viewed and clicked by users. 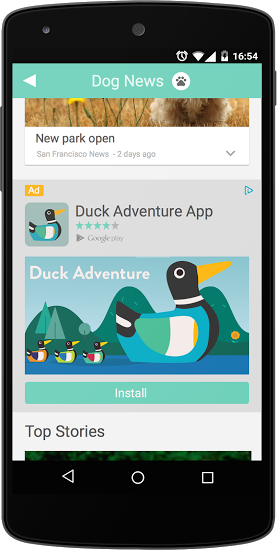 Native ad inventory is available on mobile apps as well as desktop and mobile websites. For more information on native ads, see Overview of native ads. A call for a native ad is made to Authorized Buyers. The call specifies one or both of the native ad templates below, each specifying the desired native fields. Authorized Buyers sends buyers an RTB bid request containing a list of the fields being requested. Interested buyers respond with the requested fields. Authorized Buyers runs an auction to select the winning bid and sends the buyer's supplied creative assets to the publisher. The publisher assembles the assets into a native ad and styles them to fit the site's design. Note: If you are using the Protobuf OpenRTB implementation, you will not receive BidRequest.imp.native.request and must respond with BidResponse.seatbid.bid.adm_native. Protobuf bid responses containing BidResponse.seatbid.bid.adm will be filtered. Fields marked Required are required by the bidder. Fields marked Recommended are not required by the bidder, and the publisher may or may not display them if supplied (for example, star rating). Call to Action (CTA) is always marked as Recommended because a default is assigned if one is not sent by the bidder, but it will always be displayed if sent. Other templates exist, and may have a different set of requirements for fields, dimensions, and sizes. The following table lists the fields of an app install ad template. Mobile apps use these fields to create native app install ads. Headline The app title Required Yes 25 chars Flood-It! Body Main text of the app Required No 90 chars Deceptively simple + tantalizingly challenging = delightfully addictive! If a buyer sends a text asset (body text, for example) longer than the suggested maximum number of characters, the text may be truncated and ellipsized by Authorized Buyers or the publisher. Note that the truncation limits are half the size in Chinese, Japanese, and Korean. For example, the headline limit is 90 for English and 45 for Chinese. Crop the main image symmetrically by up to 20% in one dimension (height or width). Scale the image without changing its aspect ratio. Images that have aspect ratios substantially different than those implied by the height and width may be filtered. The following table lists the fields of a content ad template. Publishers use these fields to create native content ads. Body The ad content Required No 90 chars Your home sweet Brooklyn home - cheaper and sooner than you think! Advertiser Text that identifies the advertiser or brand Required No 25 chars NY Mortgage Inc.
NativeAd.click_link_url Link.url The URL that will be called by the browser when the user clicks the ad. Can be the first step of a redirect chain that eventually leads to the landing page. Must be set if the bidder intends to bid. This is the set of destination URLs for the snippet, including the URLs that the user will go to if they click on the displayed ad, and any URLs that are visible in the rendered ad. Do not include intermediate calls to the adserver that are unrelated to the final landing page. A BidResponse that returns a snippet or video ad but declares no click_through_url will be discarded. Only set this field if html_snippet, video_url, or native_ad are set. This data is used as a destination URL declaration, for example for post-filtering of publisher-blocked URLs or ad categorization. For non-native ads, it is not used for click tracking or any other ad functionality; it is only used as a destination URL declaration. For native ads, if NativeAd.click_link_url is not set, the first value of click_through_url is used to direct the user to the landing page. In addition, all values are used as destination URL declarations (similar to the non-native case). NativeAd.click_tracking_urls Link.clicktrackers Optional. Additional URLs that allow advertisers to track user clicks on the ad. Ad.ad_choices_destination_url BidExt.ad_choices_destination_url Link to an ad preferences or opt-out page. If present, a standard AdChoices icon is added to the native creative and linked to this URL. This is supported for native ads but is not part of the native message in the bid response. Ad.impression_tracking_url NativeResponse.imptrackers The native impression should be tracked with impression_tracking_url in Authorized Buyers real-time bidding proto or Native imptrackers in OpenRTB. required_fields and recommended_fields are specified by the publisher. We show how to translate these bit fields to determine if a field is required or recommended. A bit field uses each bit of a binary value to store a true or false statement, equivalent to sending many boolean signals like is_logo_required, is_header_required, etc. but all packed together. For this example we'll use a required_fields value of 1085. Once you have the binary value, you can check the bits to see if a field is required (1) or not required (0). The table below maps the fields to their place in the binary value. Read the binary from right to left, with the 1-bit corresponding to the right-most place in the binary value. Looking at the example binary value 10000111101, the 1-bit (rightmost) is 1, signifying a required value. According to the table, the 1-bit corresponds to HEADLINE. The 2-bit (second value from the right) is 0 signifying not required. The 2-bit corresponds to BODY. Fields that are required or recommended. Dimensions for images, logos, and app icons. Specifications for the style in which the ad is rendered. Note: For the style_layout_type field, PIXEL indicates that the native unit is of a fixed size, while FLUID means it scales to fill the width of the enclosing column and adjusts the height to retain the aspect ratio. When FLUID is specified, the height and width may come through as 1x1. // Defines the bits used in required_fields and recommended_fields. // and view tracking urls are always implicitly required. // Bitfield describing which fields are recommended by the publisher. // larger image in the response. // the native ad is rendered. // Type of style layout for each native ad template. 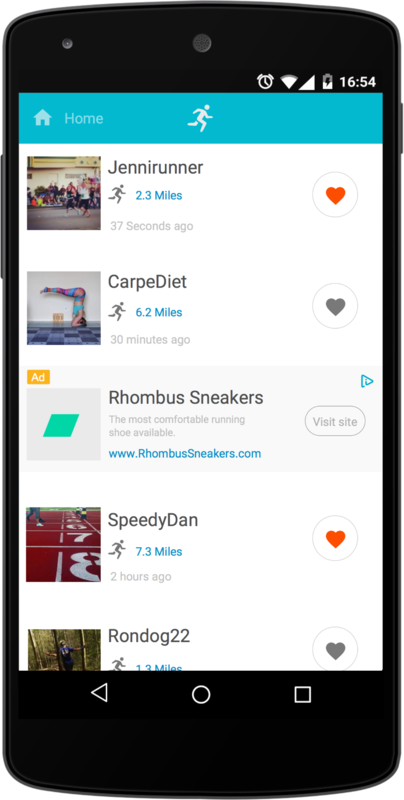 For native ads support, Authorized Buyers adds the NativeAd message within the BidResponse.Ad message. A buyer who responds to a native ad bid request must supply the fields declared in the NativeAd message. // A short title for the ad. // A long description of the ad. // A label for the button that the user is supposed to click. // A smaller image, for the advertiser's logo. // The app icon, for app download ads. // The app rating in the app store. Must be in the range [0-5]. // The URLs are called when the impression is rendered. // Deprecated. Use the regular impression tracking URL instead. // serving stack and will incorporate any URL in click_tracking_urls. // this field if html_snippet or video_url or native_ad are set. // post-filtering of publisher-blocked URLs or ad categorization. // URL declarations (similar to the non-native case). // of the response. Replaces the native impression tracking URL. // Link to ad preferences page. This is only supported for native ads. // linked to this URL. Note that the values in this response are not intended to match the corresponding request above. body: "Your home sweet Brooklyn home - cheaper and sooner than you think!"